What features should a product have? Seems a simple question, but it’s far from easy for product managers to say yay to one feature and nay to another. The Kano model helps them do so. The Kano Model is a way to identify different kinds of product features and measure their presence (or absence) against customer satisfaction. 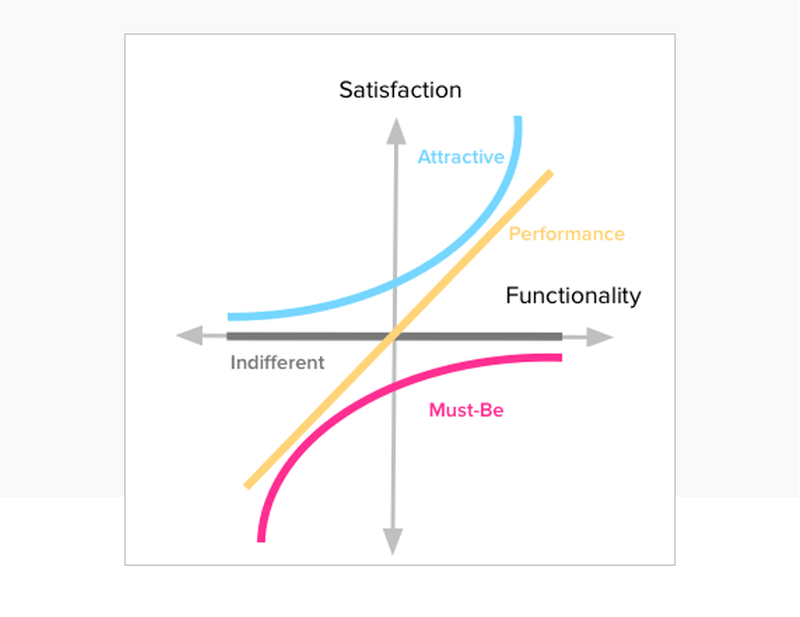 Let’s find out how the Kano Model can help you define and prioritize features in your next product. The Model was invented 30+ years ago in Japan by Noriako Kano, whence the name. Kano’s Model was revolutionary in one main aspect — it gave the lie to the belief that the more features you add to a product or service, the happier a user or customer will be. Not true, said Kano. In fact, Kano’s Model shows that some types of features will never create positive satisfaction in users, even if they’re good features. Some features, Kano’s ‘basic’ features, will only create a feeling of neutrality if present, but disgust if absent. Don’t believe us? Try this example. You want to buy a new car. You go the the showroom and take a model for a test drive. The brakes work fine. Are you delighted by the brake feature? No, you expect them to work as a given. But if they didn’t work, you’d be outraged, right? The Kano Model teaches us that not all features are created equal. Track feature implementation against how the user feels and you can prioritize features, plan product launches and have better market impact. Enjoy the rest of this article on Justinmind’s blog here.